Accobiotech SDN BHD is a well-established distributor & contract manufacturer of rapid diagnostic test kits from Malaysia. Our diagnostic kits Influenza A/B Test Kit, Hepatitis C Test Kit, Dengue IgG/IgM Test Kit, HIV Test Kit, Drug of Abuse Test kit, PSA Test Kit, H. Pylori Test Kit, Pregnancy and more other diagnostic test kits have been proven for its high precision & reliability and is used by healthcare professional in hospitals, clinics and diagnostics center worldwide. 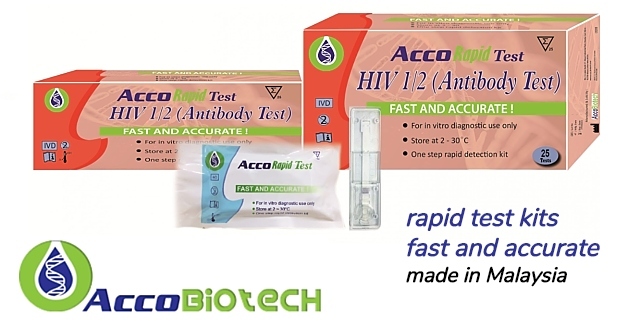 Accobiotech’s current focus is on development of fast, reliable & cost effective rapid diagnostics kits for infectious diseases, cardiology, oncology, drug abuse tests & women’s health.